The Lancaster Station burglary suppression team has been investigating a series of commercial burglaries on and in the vicinity of Lancaster Blvd. A burglary suppression team member proved invaluable when he saw two individuals walking on Lancaster Blvd who closely resembled the suspects he had seen in video surveillance footage from some of the commercial burglaries. As a result of the burglary suppression team’s skilled detective work, a search warrant was written and served at the subjects’ residence. Property was recovered during the service of the search warrant that had been reported stolen during the recent commercial burglaries. The recovered stolen property included several flat screen televisions, computer equipment, and electronic devices. 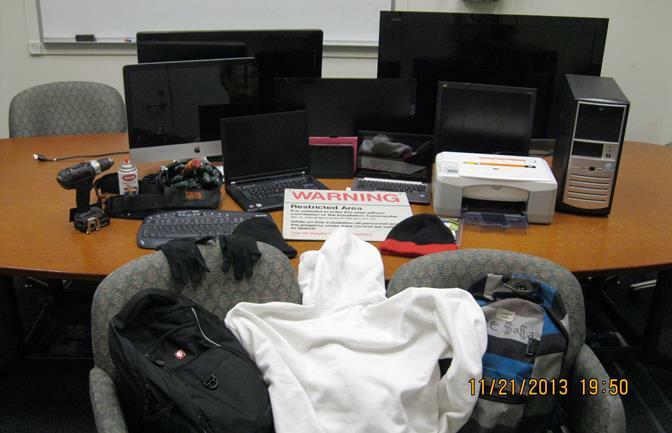 In addition, deputies located and recovered clothing the burglars were wearing during the commission of the burglaries. Based on the outstanding investigative efforts by the burglary suppression team, two male juvenile subjects were arrested and booked at Lancaster Station for burglary. Both juveniles are currently being housed at Barry J. Nidors Juvenile Detention Center in Sylmar. Anyone with information about these burglaries is urged to contact the Burglary Suppression Team at Lancaster Station (661) 948-8466. 14 comments for "BLVD burglars arrested"
Do you all really think putting these juvies in Sylmar will stop them? They are most likely back on the street by now. It’s true…the deputies work very hard to protect us, but our system fails us. Jail is no longer a deterrent. Its a party for all the criminals to get together and laugh at the system knowing they will be released fairly quick. California is a joke! Criminals across the United States…come to California and break the law. You receive a slap on the hand. Oh…and lets not forget…these criminals probably receive some form of government money!!!! SSI (never put a dime into it), GR, and the famous At Home Care Giver!!!! What a joke! I work with juvenile criminals that hide behind an emotional disturbed diagnosis…. They spend less the 2 hours in Sylmar or Olive View before released…. Everyone one of them collects a full SSI check even though they never worked a day in their life and they get even more hand outs every time I see their file….. The serious leaches of society…… So I would bet the kids are already back on the street….. The sad part is that many times when a sheriff arrests a kid at my work it goes like this….. The cop tells them the are being arrested for such and such…. Handcuffs them…. Reads them their rights….. Fills out a ticket…. Un handcuffs them….. Has kid sign ticket…. Explains to them they have to go to court on such and such date…. We take kid back out of office as the kid laughs and tells us he don’t care bout more f Ing pig…. And when court date comes around the judge gives the kid probation and then the probation people never respond to our emails or calls because they are swamped with 100x’s the normal caseload…. I don’t think it’s fair to assign your profiling fantasy to these losers. They are criminals, period. The part that bothers me is that criminals creep around the Blvd. and target hard working people. Before you start applauding the Sheriff’s who reside on the same street, why not ask why this is continuing to happen? Why aren’t they keeping their own street clean? If they can’t get a handle on Lancaster Blvd, from Sierra Hwy. to 10th St. West, then they aren’t working very hard. I don’t feel safe on the Blvd. after the sun sets, let alone during the day rubbing shoulders with homeless and criminals looking for a mark. Really, Lancaster, get it together for crying out loud. Excellent work by Lancaster Sheriff Station Deputies. You have proved once again that it’s attentive, thinking cops on the beat that make the difference in catching the bad guys! Still no help, however, from the multi-million dollar flying fumble of Wrecks and his buddies, the Eye in the Sky… All that money for…? This program should be cancelled and that money put back into getting more Deputies like those in this article on the streets! So glad them punks got caught! Hope they keep catching them an get them out of the AV! Awesome job! Now catch the ones burglarizing all apartment complexes on Gadsden. Thank you to the Lancaster Burglary Suppression Team. Truly one of the best around! Great job…3 cheers to the Burglary Suppression Team. Put them away, keep them away!!! justsaying…. The sherriffs department took everything in our house and claimed it was stolen. We showed reciepts for our property and they continued to take it. When you harbor criminals, all the property is suspect. Those are my tools for work. Can I have them back. Gonna have to prove that in court I bet.